There are not a lot of cloud backup offers available these days to save money but the two that are currently offering deals are Carbonite and IDrive. These two services in some ways have been going head to head since Rush Limbaugh ticked off people, which he tends to do, with his comments about Sandra Fluke. At the time Carbonite was advertising on the Rush Limbaugh show and it sounds like it was a pretty good deal for them. After Rush Limbaugh’s comments Carbonite decided to pull their advertising from his show and IDrive quickly jumped in and filled the spot. Usually when I write about two companies I sit and compare each feature, how well it works and decide a winner based on what company offers the best features. Carbonite and IDrive are pretty similar feature list wise and really both offer a good service. IDrive’s feature list might be slightly better actually, but they have one feature that Carbonite still beats them on, unlimited storage. But if you were to choose between Carbonite and IDrive both will provide you with a solid cloud backup service and help keep your files safe from what ever disaster might come upon your computer or mobile devices. The point of this post is not to compare the features of the services but to simply look at the only two companies offering discounts at the moment and which one offers you the better long term deal. The reality is you don’t want to be switching cloud backup companies every year. Uploading your data can take a significant amount of time and once you choose you will probably stay with that company for 5 or more years. For one computer backing up 1TB of data or less, here is the cost breakdown taking into account the first year discount currently offered by Carbonite and IDrive. The total difference between the two is only $35.07 over five years. Not a large difference for only one computer with under 1TB of data. The bigger difference will come into effect if you either have more than one computer to backup or if you go over the 1TB storage limit that IDrive has. Looking at the cost for two computers over five years that have 1TB or less of data makes IDrive look considerably better since Carbonite charges based on the number of computers you have. That is a whopping difference of $323.02 over the five years in favor of IDrive. This number assumes that you can keep your backup data size below the 1TB storage size your initial IDrive subscription allows. If you need more than the 1TB allotted IDrive charges $0.25/GB/month for personal plan storage. If you require a modest 100GB per month for 12 months with growth of 100GB per year the numbers look a little more different. Let’s take a quick look needing to backup two computers needing more than 1TB of storage after the first year. As you can see the IDrive account becomes much more costly over five years if you need additional storage. $1296.98 more costly in our example actually. In fact after the second year it is cheaper then to upgrade to the 10TB account at a cost of $499.50/year. If you are looking for a deal on cloud backup IDrive certainly is a great deal, I would not be promoting it if it wasn’t, as long as you can keep your storage below the 1TB. If you need to go over that amount IDrive gets more expensive quickly and Carbonite becomes a better deal. This post is just a reminder to do some simple math before you sign up for a discount and take your backup size into account otherwise you could end up being in for a shock. Overall I would recommend both Carbonite and IDrive, just remember to take your storage size and number of computers into account. 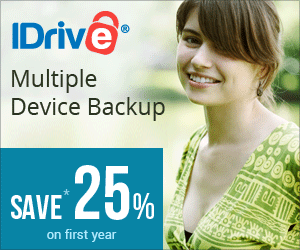 Click here to save 75% on IDrive! Click here to sign up with IDrive! I’ve recently tested IDrive but the upload and download speed is so bad, that I decided to terminate my free account and walk away. In the forum of IDrive there are also many many complaints of unhappy customers about the very poor speed they provide you with. It looks like they are running a 100Mb/s network else I cannot explain that the average upload (and download!!) speed is about 500kB/s. So, from a financial point of view IDrive might be attractive, from an operational point of view you better spend the few extra dollars to a cloud backup service provider that offers you a decent up- and download speed. Anyone who wants to give IDrive a try, use the free account first and test the speed yourself!!! Thanks for your comment. Always good to hear how things are working for others. I never had that problem with IDrive, and I have been running it for about 3 months, but I am on a DSL connection so it is possible I cannot max out our their upstream. I do agree people should use trials and free accounts to test a service before purchasing. Some services are so bad that even the trials will hardly function, like JustCloud for example. If the trial does not give you enough space to even adequately test the service that is a clear warning sign to stay away.